I played this yesterday at high tier with a 4-player party. We rather enjoyed the investigation phase of the scenario, although I did feel that it was a bit hard to guess in advance what skills would be called on when going to a particular part of town. Given that you have limited time to investigate, it's kinda a "worker placement" kind of game and spending a phase at a location only to find out you don't have the trained-only skill needed to succeed there is a bit of a bummer. I did think the scenario made a gallant effort not to make Diplomacy the solution to every talky challenge, without making it useless either. Where it breaks down is the combat part of the scenario. We had a comparatively strong party but the balancing on the high tier final fight is just bonkers. I seriously wonder if this was playtested. It feels to me like the author took the CR from the bestiary on faith and just said "hey this adds up to the right CR/EL for the tier so print it". Well, the bestiary really has it wrong when calculating that CR. We managed to beat it through a lot of lucky dice, disciplined teamwork and a very strong party. But it's really the sort of encounter that sends the message "you'd better be powergaming because you need it to survive what almost looks like a writer cheating with monster design". 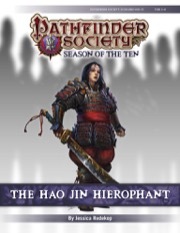 I rather enjoyed the scenario's story, it's got clever connections between setting lore and the PFS storyline and really lets Pathfinders be explorers more than murderhobos. The pacing feels natural, and you have nice agency in how to carry out your investigation. Fun RP stuff, but wtf combat? I ran two slots of this at Con of the North, one in each subtier. I played it in 8-9 subtier prior to running. The players enjoyed the lore elements of the scenario that were relatable to their prior play experience and the cargo cult feeling of the situation. When transparently run, the investigation piece was really enjoyed by the players. A lot of elements felt novel and interesting to me as a GM. The 8-9 subtier final encounter is not well balanced, but this is largely the fault of Bestiary 5 throwing balance out the window. Psychementals are improperly CR'd at best. Putting 3 of them in as "mooks" is somewhat inappropriate for this subtier. The scenario required a lot of prep due to the amount of if->then logic and organization of the material. The investigation can be difficult to convey transparently without simply describing the mechanics. 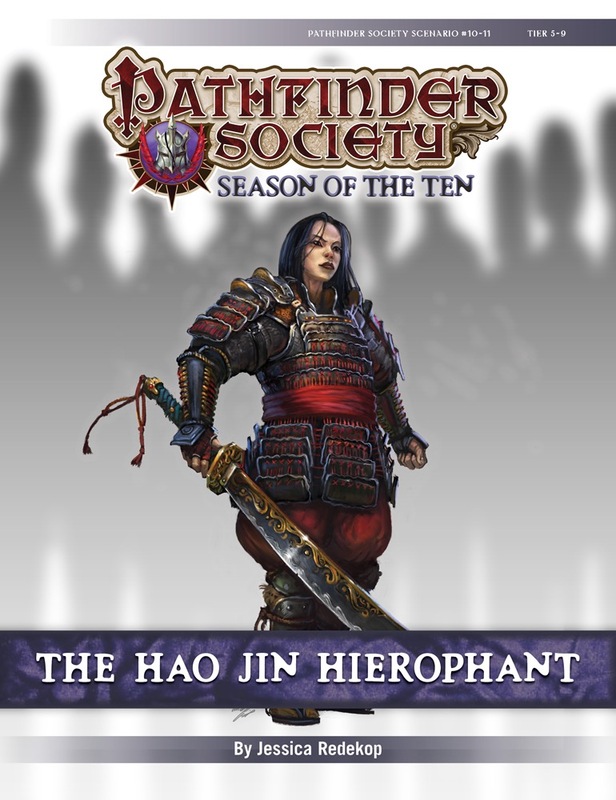 There was not enough care put into including guidance for a very likely scenario regarding Lin Fen Hai - namely, any abilities that might result in the combat ending somewhat peacefully without her being able to return to town. One item has not been addressed in the GM thread still regarding the investigation piece, where one of the locations has twice the text of some other locations and significantly more information that's relevant to the investigation, but provides no mechanical benefit. I maintain that this is an error by omission. Ultimately, I had two good tables for the scenario as the players took the mission to heart. Sincere and successful efforts were made to subdue and talk to Lin Fen Hai after she attacked - one party had 2 Slumber-capable characters and the other had Ritual of Reparation. Zero guard deaths later, both parties found themselves in the position of having adequate reason to be able to attempt Diplomacy checks and adjust her attitude as a result. Both tables struggled with the final encounter, but the 8-9 table definitely was the worse-off for it. I think the author had a good scenario here and the challenges with it likely come in at the development level. Kinda Good, but Sort of Pointless? This one was far too one note for my tastes. It was all role-play and investigation, the pacing was far too slow with nothing all that interesting to break it up. The scenario had a little bit of intrigue to it, but also struck me as casting the players in an unmistakably uncomfortable situation roleplaywise that the scenario seems to want you to just accept and move past which struck me as odd. Also, for a modern investigatory scenario, there was still shockingly little for martials to do (which given our table did a solid FOUR HOURS of investigation was frustrating, I basically didn't pick up a dice for much of this one). Outside of the singular combat at the end, there was little for a member of a martial class to engage with. Especially since the big reveal at the end, while shocking, is basically a Year 0/1 style "woops the plot twist is that there was nothing to see here" plot twist. Still a lot of the ideas here were excellent and I enjoyed that in comparison to some other recent adventures it was not terribly overdeveloped. Oof! My players got lucky and managed to slow several of the psychementals, but about half the team was dropped with negative levels, and they still made a "Grab the flower and run!" final rather than trying to finish those things off after finally managing to kill the plant. Their abilities just seem SUPER powerful for their CR, and if you use them at all effectively, it can be a easy TPK. It took so long to run that we ran out of time and we had to speed through the storm. Those little jerks have SO much health and regain SO much of it just by being fast and speeding through all the PCs forcing dozens of saves. This was by far my least favorite scenario I've ever played. That was the general consensus from the table as a whole. I've played roughly 170 of the PFS scenarios, and I've never before about walked out on the table. I only stayed not to leave my team shorthanded. It seems like everything about the adventure is setup to make it as vague, convoluted, and unfun as possible. As a bard, who should be good with most skills, I still was finding the who investigation rather infuriating. It seems like the author (haven't read it, just played) thought people were going to naturally find things out and instantly know things that they had no right knowing. One of the 2 combats wasn't bad at all, but the second one was just a bonkers. Maybe doable, but was extremely rough with what they could do. I really would prefer to give this scenario 0 stars if I could. Red Harvest all over again! Gasp! Jess's work! Jess's work! And it sounds AWESOME! Yea! Back into the Tapestry! Any update on which maps? I played this over the weekend and it was super creative, emotional, and engaging! Great to hear! I thought Jess did an awesome job with this. Maybe I missed it, but what factions are involved? It seems that it would be right up the Dark Archive's alley. Having run this twice over the weekend I really liked the scenario though the sandboxy nature requires some extra thought to figure out how to give the party a reasonable amount of guidance to enjoy the exploration and the more open RP. The first big reveal in the adventure though was a hit every single time. The last encounter was also epic both times I ran it, once a low tier and the other high tier. The rather unique feature of the antagonist opened some rather unexpected situations. "Your Tongues spell is going to last for 100 minutes. We're going to handle this by breaking your investigation up into 20-minute phases. You can spend a phase checking out any of the buildings in the village, making a Diplomacy check to Gather Information, making a Perception check to search the village, etc, whatever you want to do. You can split up and check out multiple buildings at once, or you can stick together to aid each other on skill checks. After each phase, you can meet up again to debrief, share what you've discovered, and plan out your next course of action. You can spend a maximum of 5 phases in the village before your Tongues spell wears off and you'll need to secure an alternative method of communication."